By and far the easiest way to photograph hummingbirds is to place a hummingbird feeder in our backyard and wait for the little guys to start visiting. We quickly realize that they have absolutely no compunction about being in close proximity to us. In fact, the hummingbirds that visit my feeder seem to have developed a morning ritual with my cat. Yes, I said cat. But let’s not get into that right now. Regardless of how comfortable they are around us, they are incredibly difficult to photograph. And many times, when we have gotten a good tight shot of them, it doesn’t look all that appealing in the photograph. So let’s take a look at some ideas for improving our captures of these quick little creatures. First, since we know where the hummingbirds are going to be, we can do a lot more pre-planning than you would be able to do for other wild creatures. What usually distinguishes the great shots of hummingbirds from the not-so-great ones is the background or surroundings. Another thing about the great shots is their narrow depth-of-field. You may think you are limited by your backyard, but let’s use both of the above properties to our advantage. I usually use a 70-200mm f/2.8 lens for hummingbirds set at 200mm and f/2.8. I focus at a spot next to the feeder under 6 feet away, which results in a very narrow plane of focus. And by hanging a piece of camouflage material a few feet behind the plane of focus, I get the feel of a place in the wilderness. The material is far enough out of focus that you can’t tell it’s fabric, and the camouflage pattern makes it seem like trees and leaves in the background. Second, as with all wildlife photography, patience is not only a virtue, but a total necessity. We need to dedicate a considerable period of time in order to get even one acceptable shot. After setting up my camera and lens on a tripod and getting it pre-focused on a particular spot near the feeder, I place a chair behind the camera so I can wait in comfort for the next couple of hours. My hummingbird feeder is low enough that once my camera is set up, I can comfortably look in the viewfinder from a small camp chair. Third, and most important, is lighting. I have experimented extensively with different shutter speeds, trying to get different amounts of motion blur from the hummingbirds’ wings. My conclusion thus far is you have to freeze their wings. I’m not quite done with this experiment yet, but I do spend more time trying to get that perfect “frozen wing” shot than I do trying to find the perfect shutter speed. To freeze their wings, you have to use a flash. I use three flashes. The first is in front of the bird and slightly below, which lights their breast nicely, freezes the wings, and gives that pleasant catch light in their eye. The second is placed behind the bird and slightly above, which brings out the colors in their back. I have never been able to capture these colors with any natural lighting; they always look drab and undesirable. But with the flash, those brilliant colors pop right out. The third flash illuminates the background and is adjusted for the balance I want on that particular day. The two subject flashes are always set to their lowest power setting, giving me an effect exposure of about 1/10,000 of a second. While the shutter speed is set to 1/200 for proper synchronization, the flash duration is what determines the exposure and gives me that floating frozen hummingbird look. Once I am set up, it is just a matter of sitting there waiting for them to come into my viewfinder. They usually take a while to start feeding on the petal that I have pre-set everything on, but eventually they ignore all the contraptions I have placed around their feeder and use the one that they want to. So it becomes a matter of waiting for them to use the petal I have set-up on and being ready to shoot when they’re in the frame. My hummingbird shots have improved dramatically since I have started using this technique. I still want to tweak it in an attempt to get better, but what I am getting now is magnitudes of levels better than what I was getting before. The idea for this image was to capture a simulated bear attack. To do this, Humphreys shot a bear (with a camera, the bear was taxidermied, so you know, already dead) in Bastrop State Park in Texas. The team set up their props and equipment, including off-camera lighting and smoke machines, in the forest setting and worked into the night to get the final image. With a pre-planned description of what was required for the image, Humphreys was able to come up with a dramatic image to portray this terrifying moment using Photoshop. Again, the crew used the Bastrop location to get this shot of a literal dear in headlights. They set up the deer in front of a Porsche on the country road to make it look like it was about to be struck by the car. This was the hardest of the shots. Since they didn’t have their own stunt crew and a huge Hollywood budget to let them demolish a car by driving it off a bridge, the photography team took photos of Rowe Valley Bridge in Taylor, Texas on its own and a bunch of photos of a car suspended over a body of water, then merged the two images together. With a few minor adjustments to the car—they installed some strobe units in the headlights and welding a pipe to the bottom to stick in the mud—Humphreys and team were able to hang the car over the water to get the shots they needed. Two years and thousands of miles later, this passion has led him from Jasper National Park in Alberta, Canada down to the border of Mexico and the desertscapes of Arizona and New Mexico, and back up again– all the while capturing spectacular mountain tops, canyons, and beaches through the lens of timelapse photography. For gear, Schat carries with him his Canon 6D and Canon 5D Mark II, a number of Canon lenses (16-35 mm f/2.8, 24-70 mm f/2.8, and a 70-200 mm f/4), a Rokinon 14mm (for stars), and Lee filters. For motion control he uses DP Stage 1 Carbon and DP Stage 0, Emotimo TB3, and his Promote Control. If you’re curious as to how Joel works his magic, check out A Day In the Life of a Timelapse Photographer. Practice “daily seeing” without your camera. When you’re out and about, pay attention to your surroundings and make mental notes of places or situations that would make a great picture. Focus on your composition. Regardless of the subject, contemplate the placement of the subject in your photograph. Consider the message you are trying to convey, and (as always) make use of the rule of thirds. Look at the light. Many photographers agree the best natural light occurs just after sunrise and about an hour before sunset. While this does provide you with the nice, warm, diffused light, you should also pay attention to the way the high sun affects shadows, colors and details on your subject. This will help you know what to do to alter the natural light if you do schedule a mid-day shoot. Believe you are creative. Even if you master the use of natural lighting and composition, you need to maintain the core belief that you are creative. If you lack this belief, you may struggle with making your best pictures. Fight self doubt. Every photographer is affected by self doubt. When you see an amazing photograph, you may question whether or not you would be able to create the same image. Rather than listen to your inner critic, you should allow yourself to play creatively and snap photos outside your comfort zone. You will probably be pleasantly surprised by the results. Look beyond the simple subject and find the “hidden gem” of the picture. “The color palate of the rose was so yummy, but I knew there was something more to it than just the picture of the rose,” says Tharp. She looked deeper into the flower and saw the layers of the petals with this single dew drop. Be aware of your surroundings and learn to “sift through the chaos.” Tharp suggests that by looking deeply into what you’re seeing, you can take a nice (but chaotic) photo and turn it into something else. Be on the lookout. While you’re out running errands or taking a walk, bring your camera along. Snap a photo if something strikes your fancy. Respond to something specific. Create a little checklist of things to guide your eye when you’re out shooting. For example, you may want to focus on color, shadow, texture, humor, size, perspective, reflection, or lighting. Pay attention to color and shadows. Tharp suggests asking “what if…” questions to capture a more unusual photograph. Consider panning your camera horizontally while snapping a shot of a sunset with a slow shutter to get a velvety, painted look, or use a slow shutter with a vertical pan in a forest to create an abstract, blended shot of the trees. She says it is still important to pay attention to the composition of the photo and aim to create depth when making an abstract. This abstract style can give a more “art-like” appearance to an otherwise straightforward shot. Tharp visited a church that had amazing stained glass windows. She didn't want to capture the religious message portrayed in the windows, but really loved the colors. Combining the slow shutter with a slight pan resulted in this photo that looks more like a painting than a photograph. In addition to moving your camera, you can change the texture of your photograph by shooting through fabric, mesh, or wet glass, or by layering multiple exposures of the same location. Let your imagination run wild and play around with any concepts that cross your mind. Tharp says “light creates the opportunity,” but you must be able to use it appropriately. As photographers, we often seek angles that put a spot light on our subject. However, alternate lighting (such as back or side light) can give your image an entirely different mood. Watch for ways to use back lighting and side lighting. Lighting can give an ordinary object life. The way light casts shadows on your subject or captures a certain feature can make an otherwise ordinary picture into something extraordinary. Pay attention to how the light illuminates your subject or scene. You may need to reposition yourself or your subject to get the light and shadows you desire. Try shooting with a variety of back, side, and front lighting to obtain the look you imagine. Use light to create a mood. The color of the light can impact the mood of the photograph. Wait for the “quiet light.” If you do shoot during full sun, wait for a cloud to pass over the sun to diffuse the light. Tharp calls this “quiet light” and says it’s great for photographing people and capture details in an object. Tharp waited for a cloud to pass so she could capture the detail of the letters engraved on this old tombstone–something she says would not show up in a photo if photographed in full sun. Subject Position. Tharp suggests starting with the infamous rule of thirds–a technique that draws imaginary lines through your viewfinder, breaking your image into thirds both horizontally and vertically. This results in four intersecting places where you can place your subject to make your composition more dynamic. To figure out which of the points to use, decide what story you want your image to convey and consider people in this country most often read (and view photos) from left to right. Tharp wanted to convey the story of “old and new,” so she wanted the viewer’s eye to travel left to right along the branch, out to the seed pod, then follow the pod down the right third of the photograph. Compose in a way that feels comfortable. Don’t force the subject to be in a location that feels awkward or unnatural. Consider negative and positive space. More negative space will force the focus onto your subject, while filling the space with your subject often gives a more intimate feel. The story you’re trying to tell will help you determine how much negative space you should use. Allow space for moving objects to “move.” If you photograph a running horse, allow more space in front of the horse for it to run. This helps portray the action and looks much more natural than a photo that captures the horse running out of the frame. Get one axis off center. If you are photographing a subject that could be completely symmetrical (a reflection, a face, flowers, etc.) you need to make sure that one axis is off center. The reason being that as humans, we like to look at something that is asymmetrical rather than something symmetrical. Tharp framed the image to move the horizontal line of reflection above the midline of the photo to make a potentially symmetrical image asymmetrical. Proportion and Scale. In a photo with several potential subjects, you should draw the viewer’s eye to the intended subject by making it larger. Tharp says this can be done through the use of perspective, by putting your subject closer to the camera. Counterpoint. Sometimes you need additional information in the scene to convey the full context. By adding small counterpoints to your photograph, you can better tell a story without drawing the focus away from the subject. Without the hanging meat in the background, the viewer would never know this man is a butcher. Angles. “Setting up a tripod at shoulder height is static,” says Tharp. To create a more dynamic image, you need to change the angle from which you shoot. Most commonly, this means you either need to get down on the ground and shoot upward, or find a way to elevate yourself (or at least your camera) to aim downward and capture the image using an elevated approach. Tharp got down on the ground to capture this low angle of this car and its reflection to produce a more dynamic photograph from an otherwise stagnant, static situation. Leading the Eye. As a photographer, you are a storyteller. Therefore, you need to create a complete story within the confines of a single image. Ideally, you want to compose your picture so you lead the viewer’s eye through the entire photograph, telling the story along the way. Tharp admits to missing the moment between the two men because just before she took this shot, the man getting his shoes shined was looking down at the man shining them, so you could see more of a moment between the two. Instead, she captured the man looking down the street, so the viewer’s eye naturally follows his glance, looking down the street to where nothing is going on. “Where humans are looking, you tend to look as well.” Tharp says this is also true for animals in photographs because wherever the subjects glance is going, the viewer will naturally follow their line of sight to another point in the picture. Lines. Repetitive lines in a photograph make an image more interesting. Lines can be created through shadows (light coming through blinds), or natural (water falling over the edge of a rock ledge). Tharp combines the scalloped edge lines of the rock with the repetitive lines in the water as it flows over the edge. Shape. Since photography is a two-dimensional medium, every object is viewed as a shape. Combining contrasting shapes in a single image allows for an interesting juxtaposition that can create a more dynamic photo. Tharp shot this photo because it was chalk full of a variety of shapes in an interesting combination. The circles of the bike tires, the rectangular doors, and the sharp edges of the stairs are all emphasized by the reflection. Pattern. Repeated patterns can be soothing, invigorating, or add interest to an otherwise static photo. Tharp says a key to capturing a pattern in a picture is to fill your frame so the pattern spills out the edges of your viewfinder to emphasize the ongoing nature of the pattern. Tharp thought the image of the fish in the baskets would make an interesting picture as a single subject, but found the repeated pattern resulting from showing all the baskets created a much more dynamic photograph. Texture. Crisp, sharp images of subjects with specific textures add an interesting and dynamic element to your photograph. Tharp suggests focusing on something with a texture that makes you want to reach out and touch it. Ultimately, photography distills a 3D world into 2D. “Despite it being a flat photograph, we need to create an illusion of depth,” says Tharp. To do this, you need to use depth of field, perspective, and selective focus. Tharp reminds us that all these aspects will shift based on how and where you, as the photographer, move when taking the photo. Near/Far Relationship. Often used in landscape, this relationship is all about perspective. Tharp tells us that the focus is on the single guard. She visually tells us this by ensuring he won’t blend in with the rest of the guards, keeping his uniform and facial expression in focus. Tharp shares one of her photos capturing the gesture of a wave in nature. You can use a combination of the techniques listed to convey a certain mood or expression in your photographs. Tharp used a slower shutter speed to capture the chaotic scene in a shopping market. Ultimately, you want to create photographs that convey your own personality, tone, humor, and vision. 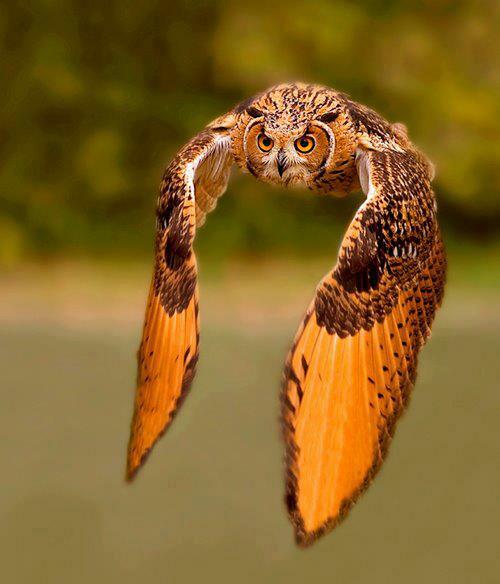 Native to the Indian subcontinent, rock eagle-owls are also commonly referred to as Indian eagle-owls or Bengal eagle-owls. They’re part of the Bubo genus, which includes many types of horned and eagle-owls, including the very similar Great Horned Owl that is native to the Americas. Owls have no natural predators. They generally hunt small birds and mammals, but they have been known to bring down prey the size of turkeys and dogs. The photograph was created with a Canon EOS 1D Mark II camera and a Canon 300mm f/4 telephoto lens set at ISO 500, f/4, and 1/2500.